It’s Week 4. Week 4? Yes, Week 4. After this week of football, one month and one quarter of the season will have been played. That doesn’t even seem possible. It feels like just yesterday I was sitting on my couch watching Ereck Flowers take a tripping and holding penalty on two of the Giants’ first three offensive plays of the season. But that was way back in Week 1. Weeks ago, when Flowers was still starting for the Giants. Now, he’s on the bench, where he has belonged for a long time and the Giants are undefeated without him playing. The 10-6 fast start to the season in Week 1 was quickly slowed by a 6-10 Week 2, in what will always be the hardest week to pick games and last week was an 8-8 performance. So after three weeks it’s about as average as it could be with a 24-24 record. It’s time to get hot before we begin the second month of the season. I had a feeling the Vikings might overlook their Week 2 game against the Bills with a potential NFC playoff or even NFC Championship matchup just four days later. And I had a bad feeling about the Vikings last Sunday after Mike Francesa pretty much said the only thing to watch for in that game would be if the Vikings recorded a shutout. The Rams might very well be the best team in the league, and they have played like it through the first three games, scoring 102 points and allowing only 36. And they might be playing their third straight home game after also playing their season opener in California. But the Vikings are much better than whatever it is they were in that debacle four days ago. They might not be on the Rams level at this point, but a giving a touchdown to a fellow contender? That’s a lot. I hate everything about this game. I can easily see Aaron Rodgers going down the field with ease on the first drive of the game and me wondering how I could back the Bills. Like I said earlier, you need to forget everything you watched the week before, and I am. This pick has nothing to do with the Bills’ win over the Vikings. It has everything to do with me knowing the Packers defense is garbage and needing to cover two possessions is too much when your defense is as shaky as theirs is. The Bills aren’t good, but neither are the Packers, who needed a miraculous comeback in Week 1 and then the worst field-goal kicking game of all time to avoid being 0-3 right now. It’s one thing to give 9.5 points when you’re good, but the Packers aren’t. Is this the end of the Patriots? I want it to be, but I know better. Normally, I wouldn’t be surprised to watch them now win 12 of 13 and finish the season 13-3, but I don’t think this team is built to do that. It has to end at some point, right? I mean Tom Brady can’t play forever, right? He can’t just keep winning MVPs and reaching the Super Bowl every year, right? The loss to the Jaguars made sense, but the loss to the Lions didn’t. Thankfully, I was against the Patriots in both game and have been against them all three weeks this season. Now they are playing an undefeated Dolphins team that keeps on winning close games for yet another season. I don’t expect the Dolphins to win, and they will probably even get blown out. But until I see even a hint of the Patriots of old, I have to keep picking against them. Especially in a division game with a touchdown line. When the Texans are on the field on both offense and defense and you see the last names on the back of their jerseys, it’s absolutely ridiculous that they are 0-3. The team is stacked on both sides of the ball and yet they’re winless and their season is essentially over. Their playoff chances aren’t as bad as if they were in the NFC, but because of how weak the AFC is once again, there is still a path for them to get there and defy odds. A loss on Sunday will officially end their season. Meanwhile, I’m more than happy to root against Andrew Luck after he failed to drop the Eagles to 1-2 last week. I was on a plane on Monday night during the Buccaneers last game, and while I was sitting looking out the window at the beautiful weather I was leaving behind in Florida to return to fall in the northeast, I was also watching my money go down with Ryan Fitzpatrick. I knew the clock would strike midnight on Fitzpatrick’s latest story because it always does, I just thought it might last another week, so I could cash in on the Buccaneers -1 after going against them the first two weeks of the season. I want Fitzpatrick to do well. I really do. Because I want nothing more than for Jameis Winston to return from his suspension and stand on the sidelines with an earpiece in, holding a clipboard. But when you’re the backup to a former No. 1 overall pick, the leash is short, even if that former No. 1 overall pick isn’t any good. A loss in Week 4, which would produce back-to-back losses for Fitzpatrick would likely mean back to the bench for Ivy leaguer. And with the wild decision making and errant throws we saw from him on Monday night, the Bears defense is going to send him back to the sidelines. I like Carson Wentz as a player and as a person, but as a Giants fan, I so badly wanted the Eagles to lose to the Colts last week in his return from knee surgery. A loss would have sent the Eagles to 1-2 and created chaos for Eagles fans wondering why the Super Bowl MVP was benched after one loss even if it was for the face of the franchise. Luckily, there’s a still a chance for that to happen and for the biggest quarterback controversy in history to take place. After this week, the Eagles play the Vikings, who will be coming off two bad losses and will have three extra days of the rest on the Eagles. Then they go on the road to play the Giants in a short week on Thursday Night Football. Then they host the Panthers and the Jaguars, and later in the season after their bye week, they have trips to the Superdome and to the Rams. There’s plenty of time and opportunities for Eagles fans coming off the team’s first Super Bowl win to completely turn on their team and question why Nick Foles isn’t playing after beating the Falcons, Rams, Vikings and Patriots months ago and then having a statue built in his honor. Just sit back, relax and wait for it to happen. When are the Falcons going to put it together? I remember asking myself that same question last season, a season in which they were coming off the biggest collapse in Super Bowl history. If the Falcons can’t win big at home against the Bengals, I will finally have an answer to my question and that answer will be never. It was fitting that the Browns’ first win since 2016 and their second win in two-plus seasons came against the Jets. The same Jets whose fans thought after their Week 1 rout of the Lions that they would then take care of business at home against the Dolphins and then go on the road in a short week and hand the Browns yet another loss and be sitting at 3-0 with the very real chance of reaching the playoffs in Sam Darnold’s first season. Instead, the Jets are now 1-2 and going on the road to play what’s currently the best team in the AFC. The Jets are going to be 1-3 after Sunday and the only games you might consider them a favorite in for the rest of the season are against the Bills, and after what the Bills showed against the Vikings in Week 3, there’s a very good chance the Jets will be picking in the Top 3 of the draft again in 2019. The Seahawks saved their season last week with a rather easy win over the Cowboys. 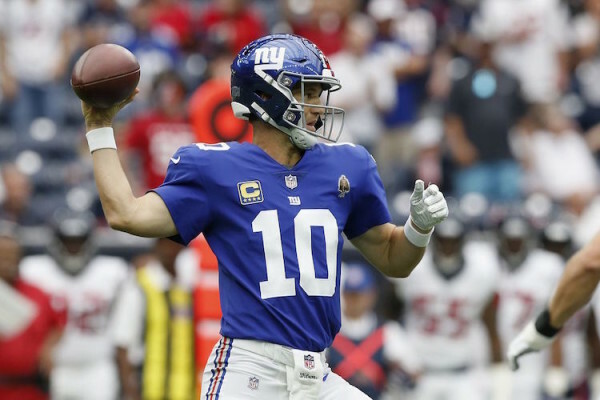 I think there are going to be a lot of easy win against the Cowboys this season, unfortunately, just not when the Giants play them. Now the Seahawks get a Cardinals team that looks like the early favorite for the No. 1 overall pick in the draft after getting outscored 74-20 in their first three games, and they get a Cardinals team that is starting rookie quarterback Josh Rosen for the first time. This after Rosen was thrown into his first NFL game needing a game-winning drive against the Bears defense. It never seizes to amaze me the poor decision making of NFL head coaches and first-year Cardinals head coach Steve Wilks is the latest to join the club. I couldn’t help but feel happy for the fans of Cleveland who suffered through a 4-45-1 record since the start of the 2015 season before beating the Jets last week. And I couldn’t help but feel happy for the fans, who might actually have found their franchise quarterback in Baker Mayfield after so many failed attempts to find their guy at the top of the draft for years. If not for missed field goals in both Weeks 1 and 2, the Browns would be 3-0. But because they’re the Browns, they did miss those field goals and are 1-1-1. Maybe the culture will finally change for the team with Mayfield playing. I couldn’t help but laugh when I saw the news that the Browns officially named Mayfield their starting quarterback for Week 4 as if there were another option. It’s not that Tyrod Taylor played poorly in his two starts with the team, but there’s just no way you’re going to sit the No. 1 overall pick and the face of your franchise after he just led your team to its first win since the end of the 2016 season and its fifth win three-plus seasons. But right now there is too much Cleveland love, and don’t you think for one second the Football Gods don’t recognize all of the hype surrounding a team people think should be undefeated and on their way to the playoffs. I’m not sure what the exact mood is in Cleveland entering Week 4 after last week’s win, but a trip to Oakland to face a winless team that had incredibly high expectations this season will be make the Browns remember they still have a long way to go. If this game were being played in the Superdome, I wouldn’t even watch it. OK, who am I kidding, obviously I would watch it, but it would be painful. I want no part of watching the Giants ever play against the Drew Brees Saints in the Superdome. But the Drew Brees Saints outdoors in the elements? That’s a different story. The Saints were embarrassed in Week 1 by Ryan Fitzpatrick, needed the Browns to pull a Browns to avoid a disastrous loss in Week 2 and then needed overtime in Week 3 to get by their division rival Falcons. I really thought this season might lead to a Super Bowl appearance for the Saints in what is a stacked NFC, but through three weeks they haven’t been even close to the team that was a Stefon Diggs miracle touchdown away from going to the NFC Championship Game last season. The Saints will be outside this week, in the northeast, where it might not be November or December yet, but this week has been rainy, windy and cold and no matter what the weather is in the Tri-state area on Sunday, it always seems to be worse in East Rutherford. The Saints offense has an inside and outside version even if they do have Brees, Michael Thomas and Alvin Kamara. And with their defense having allowed 103 points in the first three games, I’m not sure how they plan on covering Odell Beckham Jr. and Saquon Barkley given the trouble they have had covering anyone this season. The Giants are going to win this game. The 49ers season came to an end in Week 3 when Jimmy Garoppolo tore his ACL. Now the 1-2 49ers are heading on the road, knowing their season is over, to play a good Chargers team (that I keep thinking plays in San Diego) and they are starting C.J. Beathard at quarterback. Remember how bad the 49ers were last season before the Garoppolo trade? Those are the 49ers you will be seeing for the remainder of the season. When these two teams meet, the game is decided by 3. So knowing this, how can you not take the team getting points? The Chiefs offense is incredible. Their defense is not good at all. I get that the Chiefs are built on the idea that “the best defense is a good offense” and they have the best in the league and maybe even the best in history, but offense doesn’t always travel, and it rarely travels to Mile High Stadium. Five points is a lot to be giving on the road against an elite defense in a divisional game. The Broncos likely won’t be able to stop the Chiefs because I don’t know if anyone can, but the Chiefs won’t be able to stop the Broncos either, and five points becomes too much to give up in a back-and-forth offensive divisional game.